Could your little one be suffering from lactose intolerance? It’s not overly common, but it is possible for babies to develop a lactose intolerance and it can cause quite worrying symptoms. 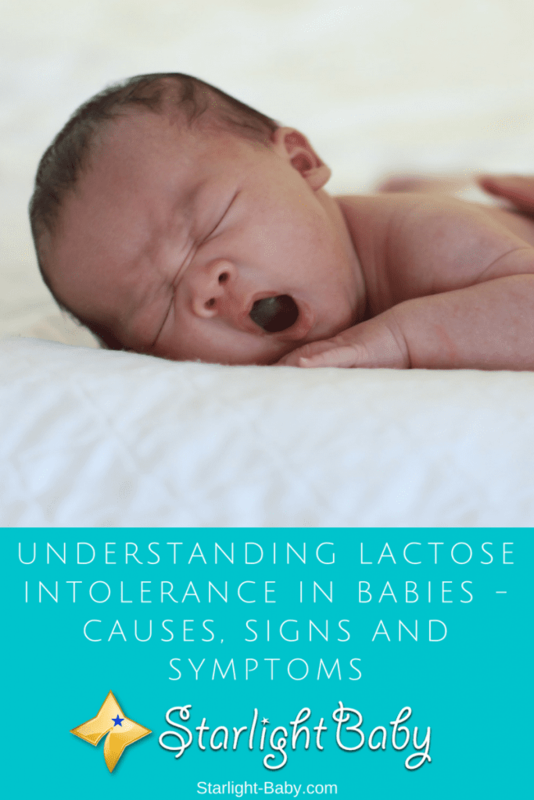 Here, you’ll discover everything you need to know about lactose intolerance in babies and why a correct diagnosis is essential. Before you can determine whether or not your little one has a lactose intolerance, it helps to know exactly what it is. Lactose is found in dairy products such as cow’s milk, and it’s a natural type of sugar. Our bodies contain a digestive enzyme known as lactase, which is responsible for breaking down lactose so it’s easily digested. A lactose intolerance develops when the body isn’t producing enough of the lactase enzyme, making it more difficult to break it down. As the unchanged lactose passes through the gut, bacteria start to eat it, causing unpleasant symptoms such as diarrhea and a build-up of excess gas. Few people are aware there’s actually two types of lactose intolerance. It’s typically associated as one general condition, but understanding the different types helps to establish the cause and in turn, proper treatment can then be prescribed. Primary Lactose Intolerance – This is typically the most common type that most people with lactose intolerance suffer with. Its main cause is genetics, which means it runs in the family. The condition develops when the production of lactase slows down due to a decrease in the amount of dairy and milk consumed. Therefore, it largely affects children over the age of two when you’ve stopped bottle or breastfeeding. Secondary Lactose Intolerance – This type of lactose intolerance tends to be caused by an issue within the small intestine. It can sometimes be brought on by a separate condition, medications or surgery. Secondary lactose intolerance can develop at any age, though it does tend to be particularly common in babies. There are many potential causes and often it can only be temporary. Again, it’s triggered due to a decrease in lactase. These are the two main types of lactose intolerance, but there is a third, rare type that’s also worth mentioning. Congenital lactose intolerance is very rare and it’s a genetic condition. Babies suffering from this type of intolerance have usually been born with zero, or very little, lactase. Finally, it’s also worth noting that premature babies can develop temporary lactose intolerance due to the small intestine being underdeveloped. What Are The Signs And Symptoms Of Lactose Intolerance In Babies? As you can see, these symptoms are pretty generic and can point to a number of conditions. Therefore, it can be quite difficult to diagnose lactose intolerance. However, you’ll usually find if it is to do with a lactose intolerance issue, the symptoms will start to develop roughly 1-3 hours after baby has consumed food containing lactose. Is Lactose Intolerance Just A Milk Allergy? No, lactose intolerance is completely different to a milk allergy. Many babies can be allergic to cow’s milk for example, but that doesn’t mean they are lactose intolerant. With a milk allergy, it produces an immune response, while lactose intolerance on the other hand, is more of a digestive problem. The main reason the two are largely linked together is because the symptoms are almost identical. However, you’ll know if your little one has an allergy rather than an intolerance if they start to develop a rash, swelling of the lips, watery eyes or a runny nose. Should I Take Baby To The Doctor If I Suspect Lactose Intolerance? Absolutely! It’s always best to seek a proper diagnosis and see your doctor whenever you think there’s a problem. They will typically ask you numerous questions about baby’s dietary habits and symptoms. Then, you may be instructed to cut out lactose from the diet to see if it makes a difference. Is It Possible To Prevent The Condition? Sadly, lactose intolerance isn’t something that can be prevented. However, once it has been diagnosed you can take measures to control it. Food labels are a great resource. Always read the labels to see whether the foods you plan on feeding your little one contain lactose or not. This even applies if you’re breastfeeding, as what you eat, your baby ultimately ends up consuming. It’s also worth keeping in mind that some babies will be more sensitive to lactose than others. So, your baby may be able to consume small amounts of lactose without developing any nasty symptoms. Monitor your little one to see how much lactose they can consume without it causing a problem. Overall, lactose intolerance is often misunderstood and it can be difficult to diagnose. If you suspect your little one has the condition, it’s worth paying a visit to the doctor to get it confirmed before you cut out lactose from the diet. If it does turn out they have the condition and you need to cut out all dairy products, you’ll also need to look into finding alternative sources of calcium to ensure baby’s bones still grow strong and healthy. Fortunately, more and more formulas for lactose-intolerant babies are becoming available, and with the help of your doctor, you’re bound to find something that works for you and your little one. Why am I not sure? Because although that’s what was diagnosed as an infant, and the doctor put her on soy, as she got older, she *did* start to develop lactose intolerance. I never really found out if it was coincidence or if it was misdiagnosed when she was an infant. In any case, yes, reading labels is vital. The frightening part is that so many things we eat (and feed our kids) have hidden lactose, and often in things that we wouldn’t normally suspect. Aw, sorry to hear. You’re so right and manufacturers should really make it a bit more clear rather than trying to disguise it – there are so many people with lactose intolerance and as you said, there’s a lot of foods we wouldn’t expect to have lactose in them. Breast milk is the safest and only best milk for babies up until 14 months at the most. My daughter, when she was 4- 5 years old, she developed allergies with the taking of homogenized commercial milk. Thanks to strained raw milk where all the natural vitamins, minerals, fats and unadulterated enzymes in the milk, I call it ‘real milk’ — her allergies never reappeared since I gave her organically grass-fed cow raw milk. Her enzyme-producing guts (gastrointestinal tract) developed and strengthened her immune system. It’s nice to know that there are so many solutions available, and things are only looking up for babies who are either lactose intolerant or allergic to milk! Appreciate you sharing this. Due to the amount of milk that my son drinks daily, I think it is safe to say that he is not lactose intolerant. It he is, he must be strong as an ox. That guy loves warm milk. Ever since I became a father, I cannot stop talking about my son. He is the coolest. Milk is what a baby primarily needs during the early months and years, and if he/she suffers from lactose intolerance, it’s a total nightmare for parents. Boss112091, you are, indeed, very lucky and blessed to have a healthy son who could drink milk as much as he likes without any problems. Even though that my baby luckily doesn’t have any sort of lactose intolerance problems, I am still pregnant and I feel like educating myself just INCASE is good – that’s why I read this very thoroughly. I know how hard dealing with such things can be, especially for the parent since we all want our little bundles of joy to be well off. I’m just glad that we are able to somewhat compensate the basic milk products with other ones so that the baby can still get the much-needed calcium. Thank you again for explaining it so well. I will be very careful when the newborn comes. Fingers crossed that she will be healthy though. This is really informative! I have read about lactose intolerance, I thought it’s cow milk’s allergy, and I didn’t know there are different types of it. My baby is still 1 year old, and I am still breastfeeding him. Though my two other children do not have lactose intolerance, I will still want to watch out for the primary type which I never knew about it. I also heard there are babies who are intolerant with breast milk. I am not sure how true this is as I was quite surprised when I heard about it. Consulting a doctor is indeed the best things as the symptoms could point to some other cause. I wonder if this lactose intolerance continues as the baby grows and if so the steps one needs to take to reverse the situation. I do know seniors do have this issue because of lack of lactase being produced in their system. Hi! iamawriter. Experts say lactose intolerance may be temporary or permanent, and some cases in children may be caused by a digestive system infection. So, you’re right, it is always best to consult a doctor. During the first few days, we fed our baby with formula milk. My wife was not lactating and there was no option rather than feed formula milk. When wife started lactating, her breast milk was enough for the baby. In the last 4 months, we have not fed our baby anything except mother’s milk. Therefore, we don’t know yet whether our baby is intolerant ot lactose or not. Soon we will start giving other food for the baby, including dairy milk. Thanks for bringing this issue. This will help us understand our baby’s needs. This information on lactose intolerance is very educative as well as interesting to any parent out there, especially those that are new to the parenting task probably with the first baby close at delivery. It’s definitely going to make them not freak out when they notice some of symptoms of lactose intolerance in their babies like Diarrhea, Pain in the stomach, and Bloated stomach. The information provided here would very well certainly make them know the next step to follow in getting this corrected. When I read this article first time, I was a new parent with a few months old baby boy. The subject was new for me. I I had never heard of the term lactose intolerance, and I did not know what it was. After reading this article, I checked for the signs and fortunately, my baby did not show the symptoms of lactose intolerance. Currently, my baby feeds from his mother’s breast and also drinks around 300 ml cow milk every day. I don’t know if I could conclude with what I read about lactose intolerance that I had that issue while growing up. You see, when mom was breastfeeding me, I always enjoyed every bit of it until it was time to change to solid food and the food that was given to me first then was baby milk. That caused me lots of discomfort and illness that mom got surprised what’s happening to her baby. We had to visit the hospital when I was one year old, and on the eve of my birthday after taking some biscuits that contained milk. The reason we went to the doctor was a result of the fact that I started having diarrhea which mom found disturbing. The drugs made me fine, but I just don’t know if that’s a sign of lactose intolerance.